Ok. So my chicken skin is a little over done. I also made a few substitutions in the marinade… we don’t like really spicy things, so I left out the chili paste, and used sumac instead (because, sumac). I subbed brown sugar for the honey. The whole thing was delicious, though maybe not enough to hoard it all for myself like David talks about in his head notes. I was disappointed that the marinade didn’t really flavor the meat, even though there was a significant amount of it under the skin. Maybe it is the result of my substitutions. Maybe it is just that I am over chicken right now (possible). We ate half of it for dinner one night and then I left the rest for my hubby as I went off on a business trip. Speaking of which I am in the car driving to the airport right now. Luckily I have an analyst that prefers to drive so that I can do other things. Long day of travelling ahead, and I don’t get back to Florida until 10pm, so see you on the flip side! This entry was posted in Meat, My Paris Kitchen | David Lebovitz and tagged Baking, Bread, Chicken, Cook the Book Fridays, David Lebovitz, Dinner, French, My Paris Kitchen. Bookmark the permalink. Hope your trip was successful! Your chicken looks great. Your chicken looks beautiful. I found my chicken was very flavorful, but I followed the recipe without any alterations and I marinated for 2 days! A great looking meal on that plate you got there! With the exception of white wine, and half the marinating time, I followed the recipe to the T. Hope the business trip went well. My plate looks very much like yours with the salad. The color of your chicken is remarkable. Too bad it isn’t your favorite. Yeah, part of it may just be that I have had too much chicken lately so I wasn’t too in the mood for it. Interesting substitutions! I didn’t find the chicken too spicy, if you ever decide to try it as written. It was a pretty subtle heat. Good to know. I will maybe give it a try at a later time. The chicken was very flavourful and i used a siracha chili paste. We don´t likevery spicy things either but there was no heat whatsover! It looks great nevertheless! Very interesting about the heat! Have a great trip! I agree with Natascha above–we like heat, but our nearly-4-year-old doesn’t. I used the harissa anyway and it wasn’t even a thing. Kind of like how anchovies add depth of flavor to a red sauce. Also, I think your chicken looks gorgeous!! 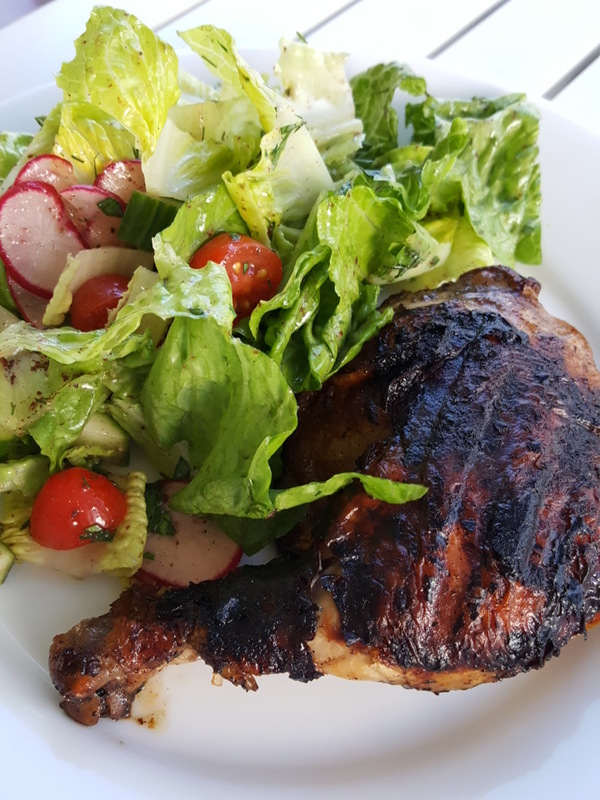 The chicken and salad looks like a wonderful dinner. And your skin stayed on the chicken. Yay! Your chicken looks fabulous! We’ve enjoyed this meal a lot, it was delicious! Hope your business trip went well! A very nice plate. And, a perfect duo. We all had the over crispy problem. I thought the marinade was the best thing about this recipe. I used Sriracha. The flavor definitely came through. Hope your business trip worked out. Long day.